I've lovingly nick-named the pups "Gumbo" (left boar), "Gimpy" (middle boar - breech) and "Girly" (right sow) - but those names won't likely stick. Gumbo and Girly will be staying here with me, and Gimpy will find a new home when he's old enough. NSW trip went well, and now I have a lovely new Rex boar to add to the gene pool. He is a lovely boar with a very coarse coat for a baby. There might be a slight coat fault - a tiny crimp - but only time and judging will tell, and it is easily amended when paired to the right sow. In this case, Cavriolet Ximun will be paired to Awesome Ki and Awesome Kiohne as soon as they hit 500g. There is an important Championship show this Sunday at Pinewood Primary School. I will be exhibiting three lovely Rex boars: Cavriolet Ximun, Sasquatch and Sasquatch Jr. and my sweet Sheba boar Jackpot. Hopefully I can get a good idea of whether or not Ximun has a coat fault and if Jackpot should be bred to my Sheba sows. 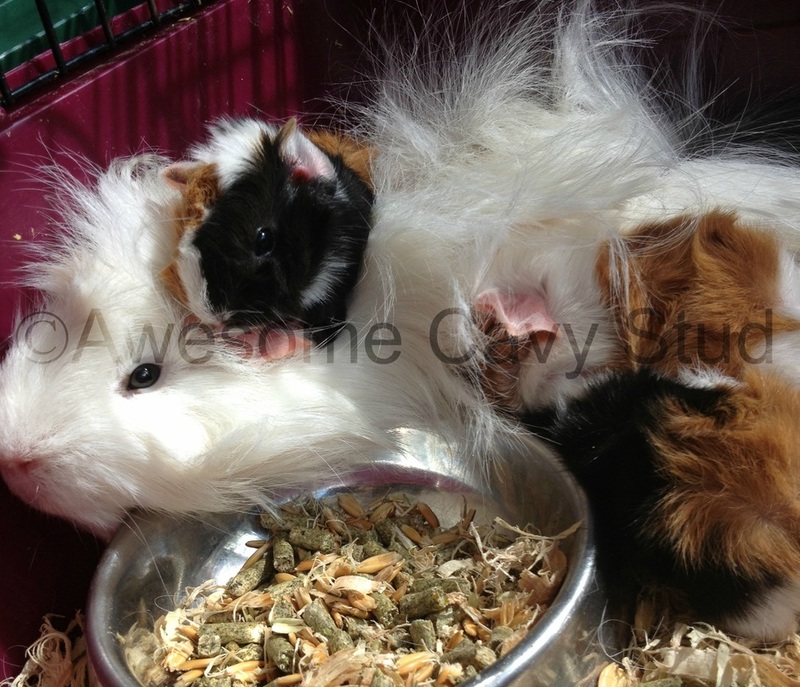 Perhaps I can even get a few new cavies to breed from in my hopes to produce high standard stock. I have JUST uploaded about 10 pictures of my Awesome babies to the Awesome Gallery section of the site, so feel free to have a look! So proud of my first set of each breed :) I only plan on breeding Rex, Abyssinian and Sheba Miniyak, so now I have my own stock of every kind. Heading to NSW tonight to visit the lovely Terri at Cavriolet Cavy Stud and pick up two of her beautiful boars to add to the family: Cavriolet Ximon (a striking Rex) and Cavriolet Kido (a very messy-coated Sheba Miniyak). 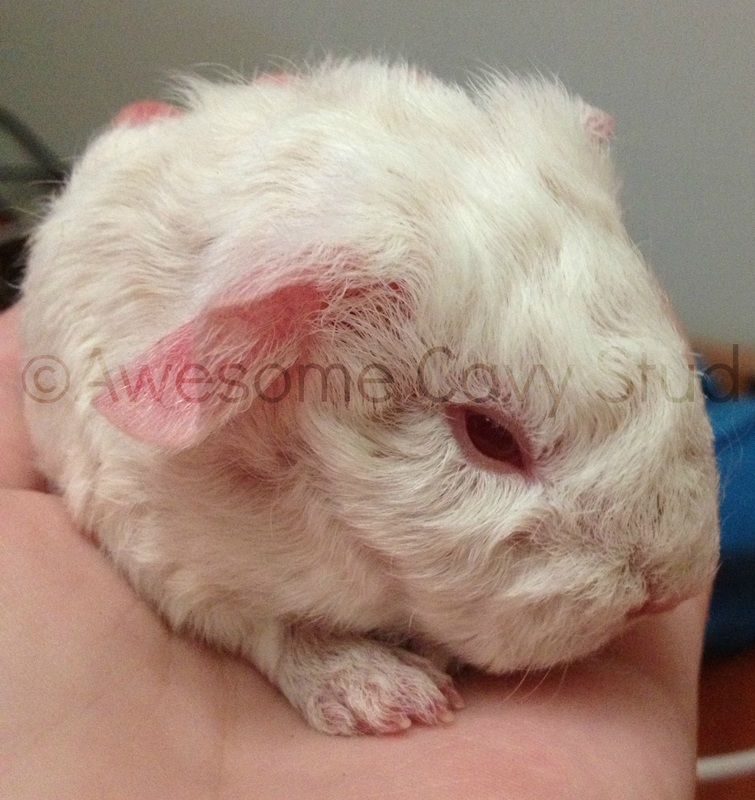 I will also be dropping off little Awesome Ayla to her - a white sow from my first litter. Here's hoping she helps Terri produce some more beautiful Sheba Miniyaks! 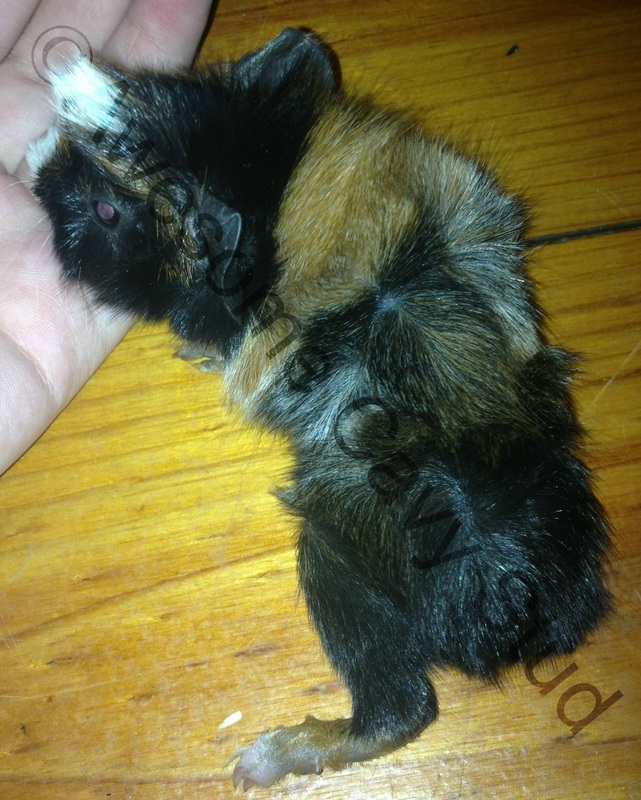 No updates until mid/late May as I will be out, but by the time I'm ready there are two lovely Abyssinian sows due to litter here, originally from Jasmine at Cavameer Cavies (Cavameer Mania and her sister Cavameer Terra - brindle sows). Looking forward to their first litter and hoping all goes well. I've been lucky so far, and plan to keep a very close eye on them both in separate breeding hutches next to my bed at all hours, just in case they require my help. Thankfully my Mum has agreed to drive down as well as a close friend who lives in the area, so they'll be able to house sit whilst I'm gone, so all 51 of my current cavies will have company and care. (Excuse my alliteration :p). I trust that they'll all be well by the time I get back. I'll still be able to reply to emails and comments, so feel free to message me with any inquiries/queries or quotes! My lovely tri-colour sow Dunvegan Quistis (with the help of her brindle mate, Dunvegan 9) gave birth to three roan babies this afternoon. Two boars and a sow. Lovely colours! Rosettes all seem to be in order, too, though I will have to wait a few weeks before I can tell how well they'll stand out. The arrival of the Abyssinians marks the day that I have Awesome litters of each of my desired breeds: Sheba Miniyak, Rex and Abyssinian. 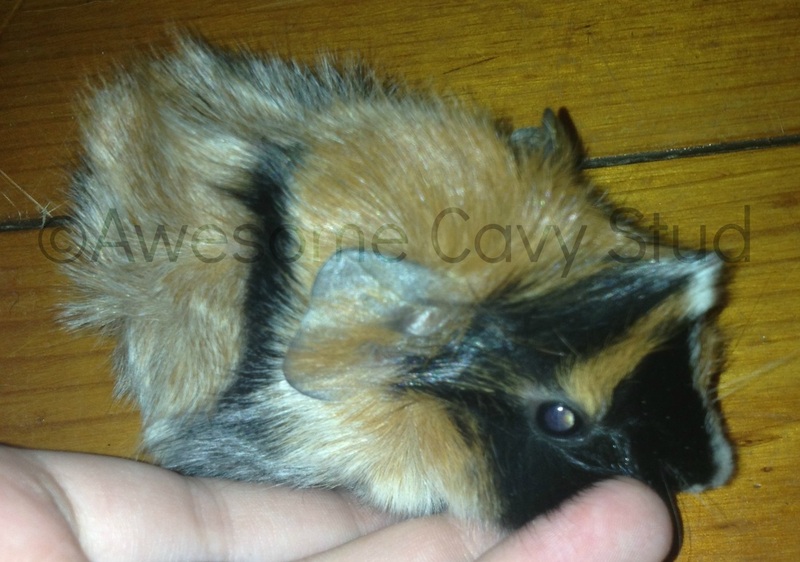 I now have fourteen Awesome cavies, with more on the way! Four more Abyssinian sows due (they're at least a month away though) and I'm done for this half of the year. The sows will litter a second time roughly in August, then break until 2014. I don't have a great picture yet, but here they are so far. 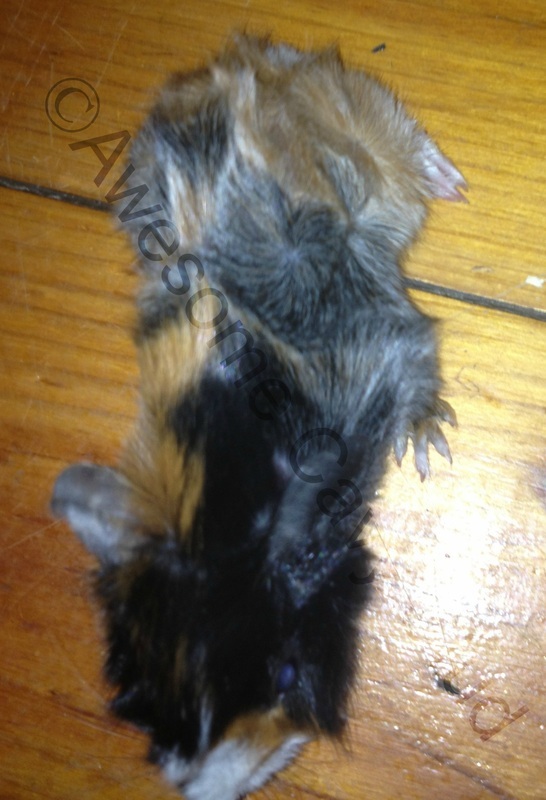 Abyssinian Litter Due in 5 days! By the feel of it, I'm expecting three bubs. Hard to tell exactly, and Quistis is still quite young. Possibly four, though unlikely. Either way, I'll try to be there for her and upload pictures is she has a successful birth *knock on wood*. 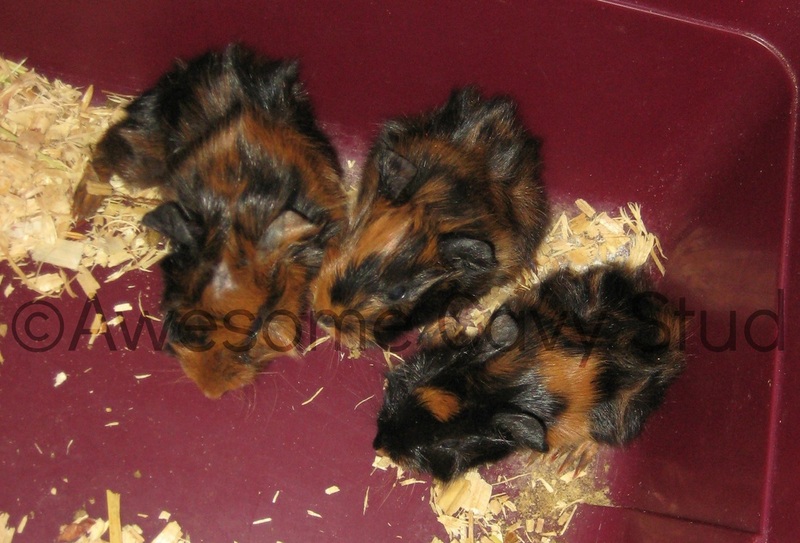 It is with a confusing sense of joy and grief that I announce the litter of my favourite sow Yowie. She had FOUR sows, but didn't remove the membrane from two (she was likely busy cleaning the first two) so they didn't make it. If I'd stayed awake and watched I definitely could have saved them. 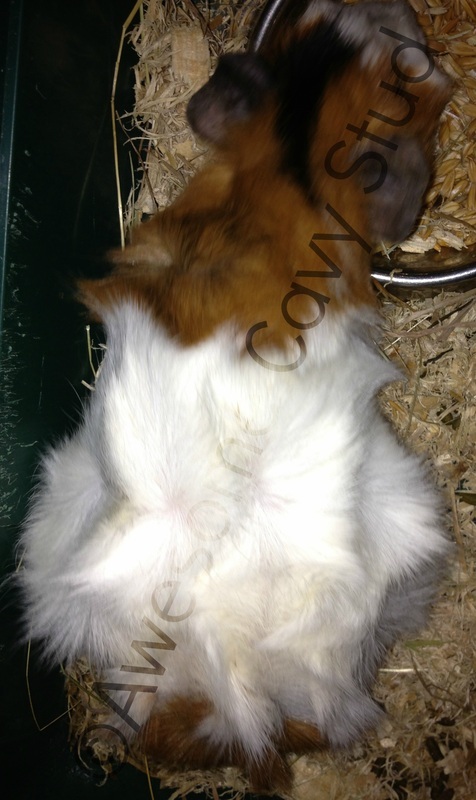 Still, the remaining two sows are beautiful: a PE white and a mini copy of Yowie. Mum is doing ok now (thankfully) but seems to be grieving. I KNEW Hel was going to litter today! I was out at the Cavy Show at Pinewood Primary School and when I got home, three BEAUTIFUL babies were waiting with her. None have pink eyes as I was hoping, but all are big, healthy and stunning. The small boar has been named Awesome Ragnarok and will accompany me to The National in NSW if his coat stays perfect. Amazing messy rosettes, large ears and clear, giant eyes. Mum is doing well and all bubs (two boars and one sow) are lively and active. 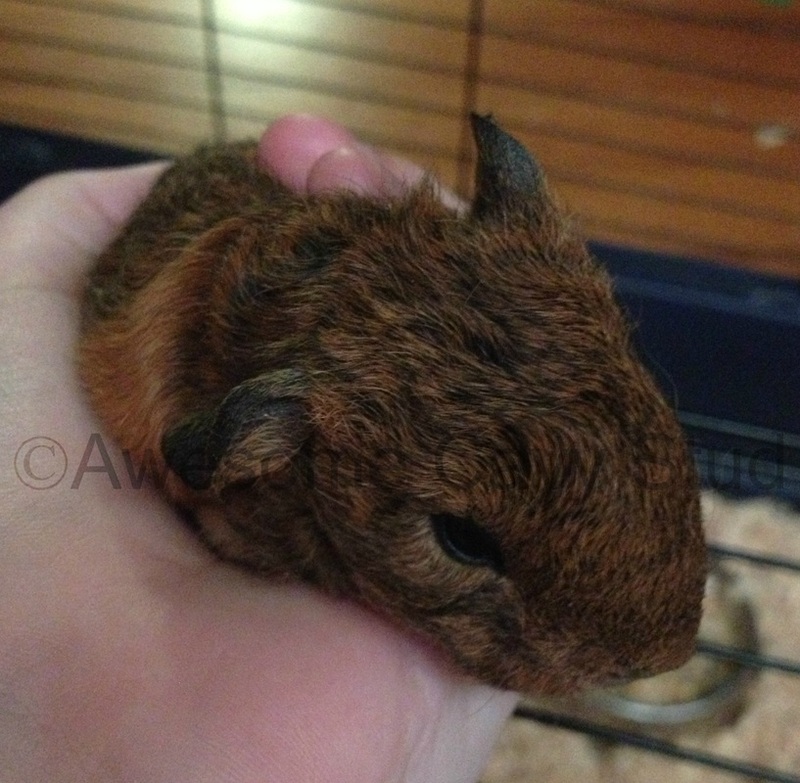 Awesome Cavy Stud welcomed the first Awesome litter today! 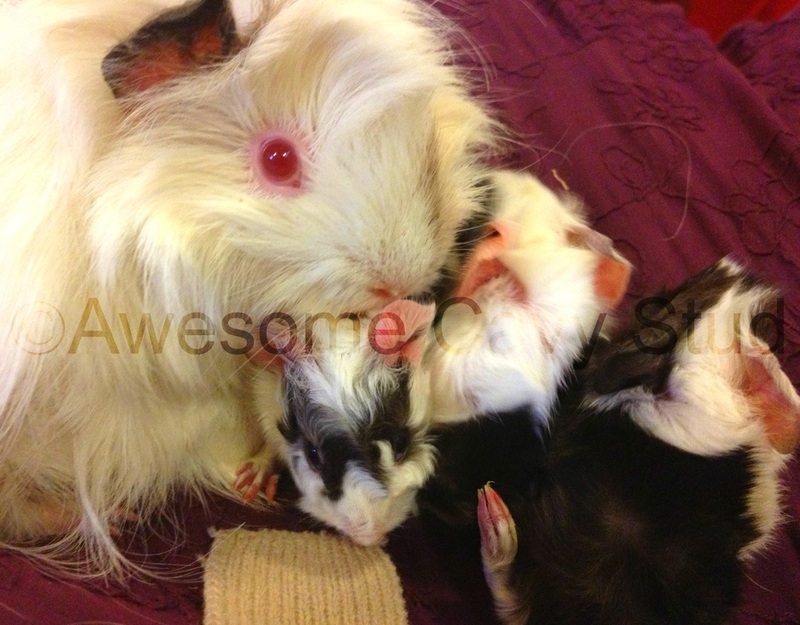 Two sows and a boar were born to my DE White couple - Snowman and Frigg. They were a week premature and needed to be fed Vitagel via syringe twice a day. The smallest was only 37g at birth. I have total faith that they will be fine as long as I keep up a strict cleaning and feeding regime. I'm Maxx. 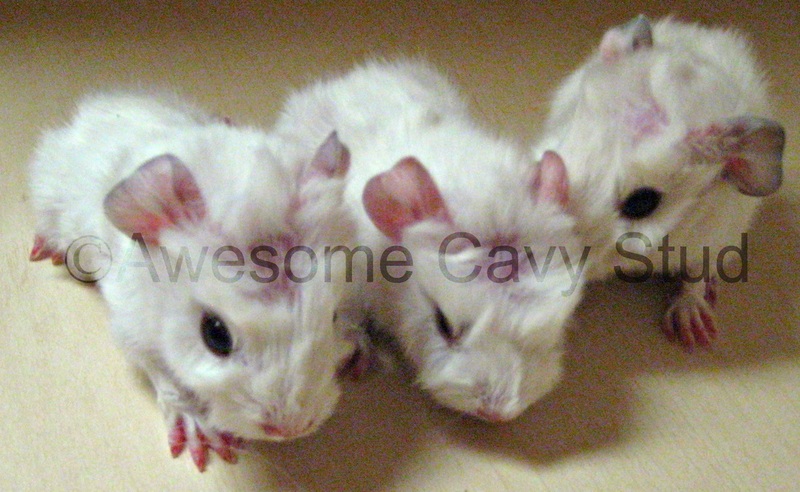 I breed Rex, Abyssinian and Sheba Miniyak cavies for showing in Australia.